Local honey | Ooh, my favorite! If you’re getting your honey out of a container that resembles a bear you’re missing out on what honey really and truly is. After a brief stint experimenting with the god-awful Tasmanian honey I vowed to support my local apiary’s raw organic honey. Honey is all the best parts of the season in a jar: whatever pollens the bee’s have collected are what is going to flavor the honey. It’s miraculous, natural process that we’ve completely lost touch with. If you’re fortunate enough to find an apiarist that pulls honey from the hives in the spring you’ll find the only pollens that bees have collected are from spring’s first flowers. It’s the most soft, silky, and fragrant honey you’ll ever have. And if you buy this past spring’s honey and save it for next year you can take a spoonful each day to work as a natural anti-histamine. Awesome, right?! 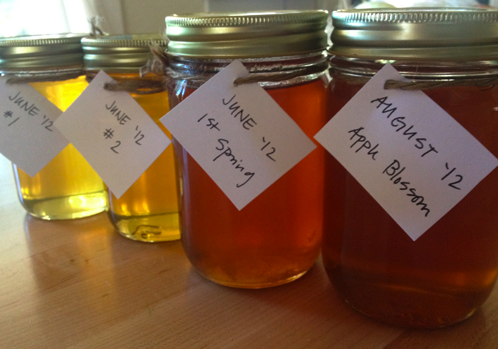 As the season progresses the honey flavors and consistency change. From the first spring honey we moved into apple blossoms, and soon to come are raspberry, then blackberry. We have our weekly trips to the honey stand planned for the next few weeks to add to our collection so far this year. Aside from allergy relief, honey is pretty much the only sweetener I use. Try switching and you’ll taste and feel the difference, as you’re literally eating from the flowers of the land around you. Truly a small but important way to feel “connected”. Colony Collapse Disorder is still a threat for bee colonies, so be sure to talk to your apiarist about where the bees are collecting. If you’re curious to learn more about colony collapse disorder read about how genetically modified corn (containing pesticides from Bayer) are contributing to the decline of the bees.